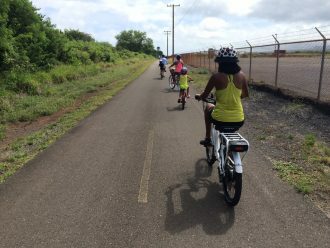 The North Shore Greenway offers a car-free, family friendly place to bicycle on Maui. It’s located on the makai side (ocean side) of the Kahului airport runway between Kahului and Paia. You can access this 1.7 mile mostly flat path from either Kanaha Beach Park in Kahului or Kaunoa Senior Center at 401 Alakapa Place in Sprecklesville. While you can ride on the wide bike shoulders on Alakapa Place and Makahiki Road, and other quiet roads in Sprecklesville toward “Baby Beach,” there is not yet a continuous bike path that will allow you to ride all the way to Baldwin Beach from Kanaha Beach Park at this time. Phase IV of the Northshore Greenway will provide the “missing link” in the current Northshore Greenway. It will link Sprecklesville to the section of the North Shore Greenway at Baldwin Beach Park. This will make it possible to bicycle or walk from Kanaha Beach Park all the way to Paia, on a mix of an off-road bike path and some quiet streets in Sprecklesville. Early 2017: Maui County has reserved $1.75 million for construction of Phase 4 in the 2017 budget. Spring 2017: The Hawaii State Attorney General to review a “Use & Occupancy Agreement” for the section of the Phase 4 greenway that will be adjacent to the Hana Highway (which is under State jurisdiction). Approval expected by the end of March 2017. Bids to go out within a month after the approval, and construction expected to begin thereafter. Summer 2017: Maui Bicycling League hopes to see the completion of this bike path by the end of 2017 or early 2018. Our mission is to create a bicycle and pedestrian friendly community throughout Maui County.